Sussex will host World Cup holders, Australia for a fifty-over match on Thursday 7th June 2018 as part of their limited-overs tour of England. 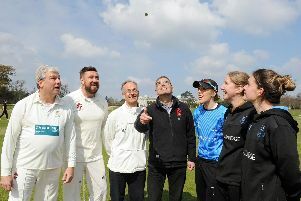 The match offers the mouthwatering prospect of the Sussex Sharks testing themselves against some of the very best one-day cricketers in the world, including Steve Smith, David Warner, Mitchell Starc and Pat Cummins. Of course, any match that features an English side coming up against Australia is always a huge occasion, but next summer’s encounter will come with some added spice. The match follows the current Ashes series Down Under and will raise the temperature nicely ahead of England’s five match ODI series that starts less than a week later. The midsummer clash will also provide a number of intriguing sub-plots. There will be the chance to see how Jofra Archer, one of the most closely-watched cricketers in the county game, fares against international opposition as he works towards England qualification. It will become clear whether the Australian batsman have what it takes to handle the express pace of George Garton, whilst the exciting, young quick will get the chance to show what he has learned from a winter with the England Lions and a stint with England’s Ashes squad. Sussex’s explosive batsmen Luke Wright and Phil Salt will be looking to wreak havoc against the Aussie quicks and send the ball flying to all corners of the ground, whilst England-man, Chris Jordan, will be keen to assert his authority before meeting Australia in the T20 International later that month. Sussex Sharks vs. Australia will take place from 2pm on Thursday 7th June 2018. Tickets will go on sale Thursday 4th January 2018 at 10am, priced at £30 for adults, £20 for youths (under 18) and £10 for juniors (under 14). Family bundles are also available and offer four tickets for the price of three (maximum two adults, lowest-priced family member goes free). A complimentary general admission ticket is available to those who hold Sussex or Executive Memberships, but they must request this ticket from the club shop. Membership packages go on sale next Monday and full details are available here. Allocated seating is available for a £5 supplement per person. Demand is expected to be exceptionally high, so avoid disappointment by securing your place for one of the county’s biggest sporting events of the summer without delay when tickets go on sale. You will be able to book your ticket online via the Sussex Cricket website, by telephone on 0844 264 0206 or in person at the club shop. A strictly limited number of hospitality packages for the match are available now. For more information and to book, please e-mailcorporatesales@sussexcricket.co.uk or telephone 0844 264 0201.